In 1924, just as the area was being transformed from the Five Points into Little Italy/Chinatown, my uncle Johnny Keyes (real name Canonico – he married my mother’s oldest sister, Mary) was re-elected the Mayor of Chinatown for a second time term by a paper-thin margin. According to the June 21st issue of the New York Times, my uncle’s opponent was Le Chung Wei. But with the backing of New York City Mayor, John Francis Hyland, “Red Mike” to his pals, Johnny Keyes came out on top by a whopping 67 votes out of more than 4,500 votes cast. World heavyweight champion Jack Dempsey also contributed mightily, in the form of greenbacks, to my Uncle Johnny’s campaign. Also a former boxer (not very good), and fight manager/trainer of international renown, Johnny Keyes handled over 100 fighters, including my mother’s brother and Johnny Keyes’s brother – in-law – Oakie Keyes (real name Daniel Mucerino). Five of Johnny Keyes’s fighters, including Pepper Martin and Midget Wolgast, became world champions. 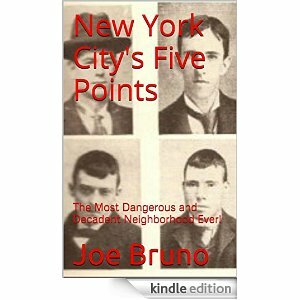 The Mayor was born on Bayard Street when it was called the Five Points. He was a local leader from public school days and was deemed the heir-apparent to the late Chuck Connors in the latter part of Connors’s administration. When Chuck died 12 years ago, Chinatown regarded Johnny as the logical successor. The Times went on further to explain how the 1924 election came about in the first place. There is no fixed tenure of office for Chinatown Mayor. An election takes place any time an aspirant feels that he’s strong enough to cope with the administration. A date for the election is fixed, and at a number of secret polling places, the ballots are marked and counted. Those known to the clerks of the polls as natives of Chinatown and its immediate confines are enfranchised. This is a big job and you can’t expect to keep regular hours at it. The Mayor of Chinatown has to sleep with his clothes on. He must be ready at any hour to rush to help Mrs. Grogan keep the old man from throwing the dinner table out of the window. When an argument between children on Mulberry Bend spreads to their parents, he must be able to keep the scratches and bruises down to as few as possible. In other words, he must keep the paddy wagons and ambulances out of Chinatown. The Chinese don’t get into too many scraps. They are hard-working and happy if they are left alone. Occasionally they have a dispute over a business matter, and this comes to me for settlement. If one steals the customer of another by giving a lower price, I am asked to stop the cutthroat competition. If a Chinaman is slow in making payments on something he bought from another Chinaman, I am asked to speed up the installments. This doesn’t happen often because the Chinese are particular about paying debts. However, according to Johnny Keyes, the most important job of the Mayor of Chinatown was to polish the bright image of the neighborhood, and not let it be tarnished by outside influences. We have no objection is people want to see a little of Oriental life in Chinatown. But we don’t want the place held up as a nest of opium dens. As mayor, I have fought to keep the moving pictures companies from using scenery in Chinatown in plays in which the Chinese are villains and white girls get kidnapped. Of late, Chinatown has wanted its Mayor to give the neighborhood a better reputation in the eyes of the rest of the world. My men listen to the talk handed out by the guides on the sight-seeing busses, and when it gets a little too harsh we step in and tell them to stop. The truth is there are probably fewer guns to a block in Chinatown than anywhere else in the city. The days of the hatchet men are gone, and there hasn’t been a knife thrown in years. Johnny Keyes also told the Times, that his responsibilities as Mayor of Chinatown included helping the local parents control their wayward offspring. Speaking to the young men who appeared headed to the Tombs is another of my duties. Parents whose boys are in bad company ask me to tell the kids they are making a mistake. The young fellows listen. I have spoken with hundreds of boys who have found it easier to steal than to work and have managed to save most of them from getting in bad. One of Johnny Keyes first actions after being re-elected Mayor was to throw a grand shindig at Tammany Hall, which he called the Chinatown 400 Ball. The expressed purpose of the events was to raise substantial cash, intended strictly for the pockets of Johnny Keyes, after he threw a few monetary bones to the Tammany Hall brass (Keyes obviously got this idea from his mentor, the dearly departed Chuck Connors). There was said to be almost 1,500 guests at the ball, and the highlight of the night was a grand procession scheduled for 12 midnight, which was supposed to be led by the famous writer, Damon Runyon, a close friend of Johnny Keyes. But Runyon had neglected to take his tuxedo to the grand ball, and a Tammany Hall bootlicker was sent by taxi to fetch Runyon’s tuxedo, which was at his upper west side apartment. By 1 a.m. there was still no tuxedo. And by 1:30 a.m., a member of the Chinatown 400 floor committee rushed up to the Silver Slipper Box, where Runyon and Keyes were holding court, and said that the taxi with Runyon’s tuxedo and come and gone, but no one from Tammany Hall had been there to take possession of the tuxedo. “Hey, Cousin, you can’t do that (Keyes called everyone Cousin or ‘Cuz’)!” Keyes said. And the next thing Johnny Keyes saw was Runyon’s back shrinking in the distance. According to the Brooklyn Eagle, Johnny Keyes was nonplused, and he decided to head the grand march himself, accompanied by his lovely wife, Mary (this writer’s aunt). But Damon Runyon Misses “Tux” and Disappoints. Was Scheduled to Lead March. Promptly at 2 o’clock, Johnny Keyes, Mayor of Chinatown, stepped down from his box to lead the march for the guests. Mrs. Keyes, in white georgette (sheer silk) embroidered in gold, was at his side, affecting one of the novelty Poiret dolls. Huge bouquets of American Beauty roses were the favors of the evening. The stately march was followed by the song “Chinatown.” Its jazz not only kept the dancers on the floor, but several went atop tables to give exhibitions of the art decried by the generation not familiar with its movements. The imposing headdress of the Chinatown 400, said to have cost $4 each, gave the wearer a dignity alike to a potentate of the Mystic Shrine and a Chinese Mandarin. Everybody had a wonderful time. Empty square bottles were everywhere. And Johnny Keyes made a mint. After my Aunt Mary died at a-much-too-young age, Johnny Keyes moved from his beloved Chinatown to Los Angeles and then to San Diego, where he opened a restaurant named Spaghetti Joe’s, which is the nickname Damon Runyon anointed Keyes with in New York City. While in Los Angeles, Keyes was also the boxing promoter at the East Side Arena. When Runyon wrote his famous play, Guys and Dolls, one of the degenerate gambler characters, Nicely-Nicely Johnson, was based on my uncle, Johnny Keyes. Besides being a savvy politician, Johnny Keyes fancied himself as somewhat of an entrepreneur, and an international one at that. In 1925, with the backing of several prominent Chinese businessmen, Johnny Keyes traveled to the Canton region of China with several of his world-class fighters, including lightweight Pepper Martin, flyweight Mickey Nelson and bantamweight Terry Martin, ostensibly to teach the locals the refinements of boxing. But, as usual, Johnny Keyes had his ulterior motives. But, alas, Johnny Keyes’s trip to China was also deficient, if one might not say utterly lacking in pep, too. As for the tens of thousands of dollars Keyes spent on his trip to China; which was, of course, the money of others, Keyes was again philosophical. Johnny Keyes was nothing if not consistent. 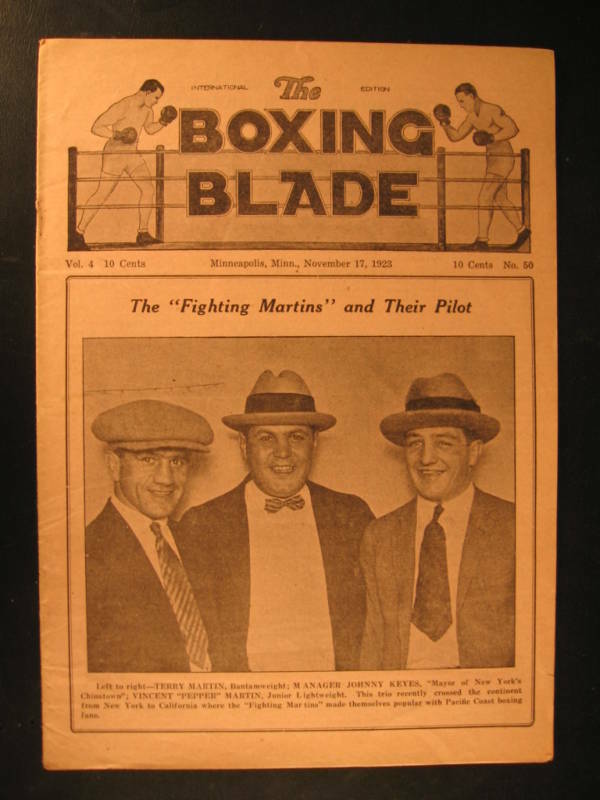 Johnny Keyes in the middle of the cover of the Boxing Blade.